People often ask me: where can they buy cheese making equipment from. I had to create our little dairy from scratch back in 2008 after an interlude of almost 10 years of not being cheese makers – before my time, so I had to discover too. It was a tremendous learning curve – what equipment, where and how does it go together, where and how to put the pipework in and most importantly, where do we get it from. The sad thing is, my uncle, who started Ribblesdale Cheese back in 1978 died in 2007, so was not around to ask. Equipment comes in all different sizes and shapes, I think what is right for you depends on your scale and access to things like three phase electricity, steam, water and compressed air. It is possible to make cheese on a fairly small scale with relatively low capital outlay and minimum resource. For example, we run cheese making classes using 15 litre bain maries – low cost, very simple, but nonetheless effective. 200 x plastic moulds which are in reality food grade soup buckets that hold 3 litres and cost 99p each. We still use them. This doesn’t sound like much, but really, all you need is a vat or some vessel to make your cheese in, you can use knives to cut and mill, some moulds, a press, something to wash utensils in and generate hot water to wash down and a container for your milk and whey. We did not have a pasteuriser as our goat milk supplier pasteurised it for us. Our next stage is to buy our own larger capacity pasteuriser, but we might be limited by our electricity supply, and if we could afford it, a small steam plant to speed up heating up the vats. Unfortunately for us, the disbanding of Business Link and Yorkshire Forward means that there are no grants available, so it could mean my kitchen and bathroom fund! Of course, you can make unpasteurised cheese, but if you are planning to sell your cheese, you should really get it tested by a UKAS accredited lab (e.g. for Salmonella, E. Coli, Staph A and Listeria) before you sell it. If your unpasteurised cheese is for your own consumption, fair enough, but be careful as it is possible for your cheese to contain harmful bacteria. Pasteurisation was developed by Louis Pasteur in 1864, originally as a means to prevent beer and wine from souring. It is based on the principle that most harmful bacteria can be destroyed by heat. There are two types of pasteuriser: continuous flow or batch pasteuriser. We have a continuous flow. It has a run rate of around 17 litres per minute, a little over 1,000 litres per hour. It would be nice if it was a little faster….one day….Alternatively, you can batch pasteurise in your vat or in a smaller vessel, say a pan on a stove, as long as you have a good thermometer. This involves holding the milk to around 63 degrees C for about 30 minutes. This method is not particularly suitable for pasteurising hundreds of litres unless you can heat it with steam. 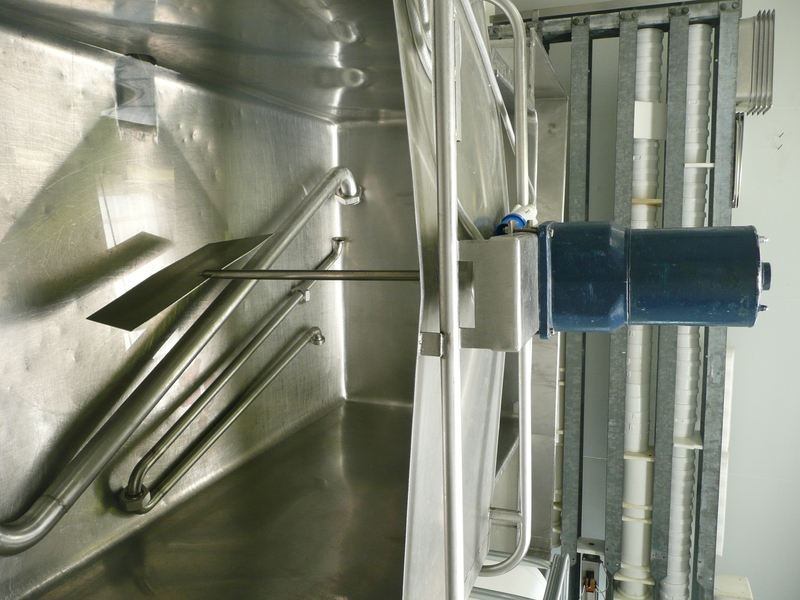 mechanical stirrers that sit on top of the vat with a paddle that you can run up and down the vat to stir. We don’t use any mechanical means to stir – we stir by hand using large blue plastic shovels. Vats also come in different forms of heating. Large vats are often heated by steam, some vats (like ours) our heated by electric elements in a water jacket and some vats, usually smaller ones can be heated by adding hot water to the jacket. There are two types – a horizontal press or a vertical press. 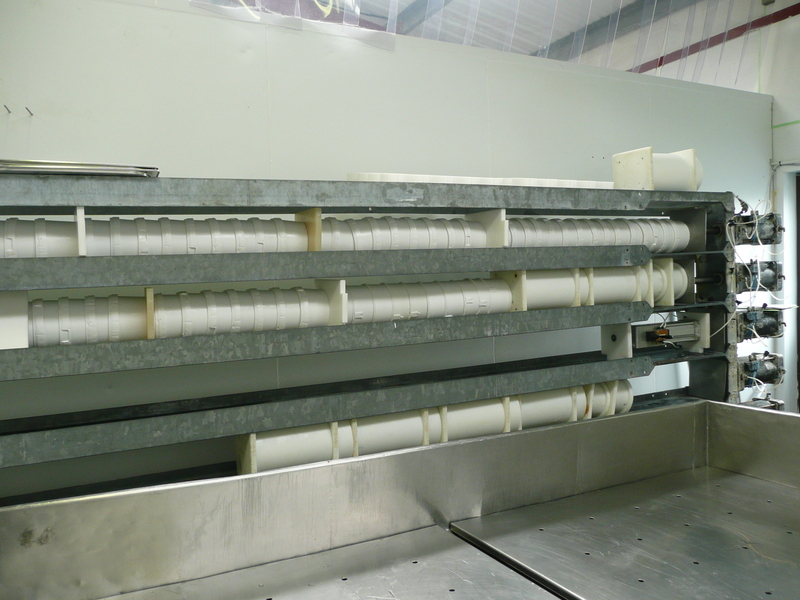 we have a horizontal press that is powered by a compressor and uses a ram at each end of the row to gently squeeze the cheese which is stacked in moulds on their side i.e. horizontally. The vertical presses, yes, you guessed it have the moulds stacked on top of each other and pressure is applied from the top, pressing downwards. Colsan: I have heard good things about these guys though do not know them myself. They have helped people who have taken our commercial cheese making course with things like vats, curd tables, pasteurisers etc. Tel: 01233 860760. Second Hand Catering Equipment sell tables and all manner of catering equipment as recommended by John, commercial cheese making alumni. Jaap de Jonge runs a business called Jongia based in Solihull. Jaap sells everything from starter culture, moulds and rennet to cheese vats and presses. He also organises small trips to Continental European cheese makers which I hear are very interesting. There’s Moorlands Cheese Making who sell small presses, moulds, cutters etc. Ascott are in a similar vein and also sell presses and cheese making supplies on a small scale. The big guys: Moody have used equipment for sale, and often hold auctions. 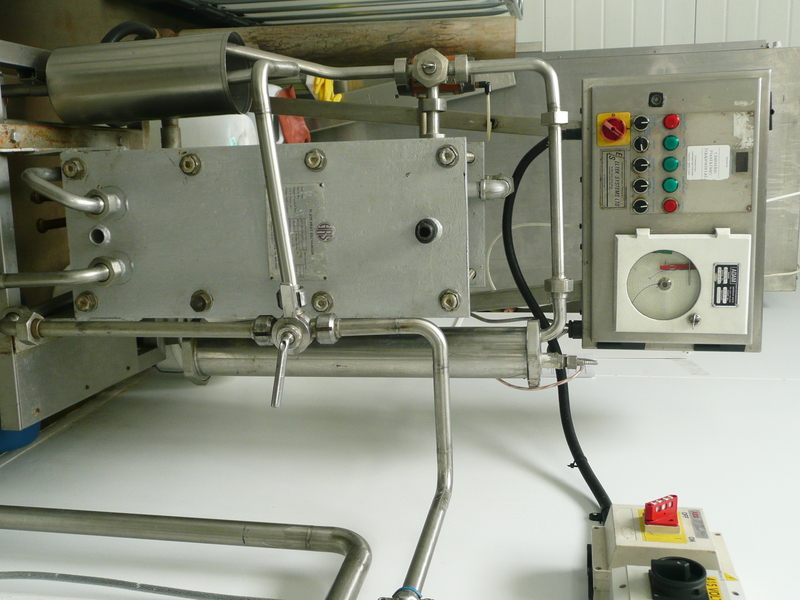 Equipment ranges from pasteurisers to complete processing plants. Lockerbie based Process Plant and Machinery also sell an incredibly wide range of cheese making equipment, admittedly, mostly rather large scale, but it is always worth asking. Another one of the big guys is Machinery World who sell all manner of cheese making equipment from pasteurisers to cheese wedge cutting machines. Boyd sell pasteurisers, ice cream and cheese making equipment too. If anyone knows of other recommended cheese equipment suppliers, please let me know and I will add to the list. hi there i wonder if you could help me i live in sth africa and i am looking to buy a small double walled vat .i wish to start making cheese as a hobby and i am really enjoying it but to get the temp right is difficult i thank you and look forward to your reply . regards john roberts big bay diamonds cape town south africa . I would like to start up a cheese making supply business in Australia. Where can I source wholesale priced culture, rennet, etc, all the necessary gear to provide to amatuer cheese hobbists please? Wanting to import it in to Australia in bulk. Apologies for the delay in getting back to you. I have passed your e-mail to a contact of mine, called Alan and he works for a very large supplier in the UK. I hope he will get in touch with you. hi i want to start goat milk cheese making ,were can i buy the equipment. Where are you based? If you are UK based, then I can recommend Brytec, whose contact details are in the blog roll list. If you are outside the UK, I am not sure I can help. I live in North Carolina and attend school for Culinary Arts. I love cheese and want to start a cheese farm. I was wondering if you could point me in the right direction. Thank you for your e-mail. Now then, a cheese farm…..well, first I recommend you learn to make cheese. I am sure there will be someone in your area who can teach you. Once you have the basics, it is then a question of sourcing milk. You should consider how much you want to make, just small quantities or larger scale, this will lead you to work out what equipment you will need. Small quantities can be made at home in the kitchen using equipment that is common place. For larger scale, you will have to find some dairy equipment suppliers – and I am sorry, I cannot help you when you are based in the US. Hi ,I live in yorkshire ,Huddersfield ,I want to know if you can help me getting cheese making equipment.